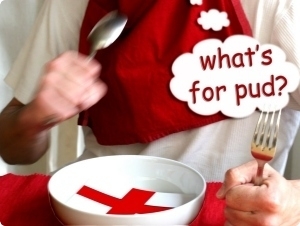 When Becks and Posh and Jamfaced invited us to celebrate St George's Day by making a traditional English pudding, dessert or sweet, I couldn’t resist. However, then Sam proceeded to list ALL the English Puddings and baked sweets that are known to mankind, and with me being me, that meant I couldn’t use any of them! I had to go one better, and since I don't like being prompted, I HAD to think up one she hadn’t listed … not an easy task with her very extensive list! However, in the end I managed it! 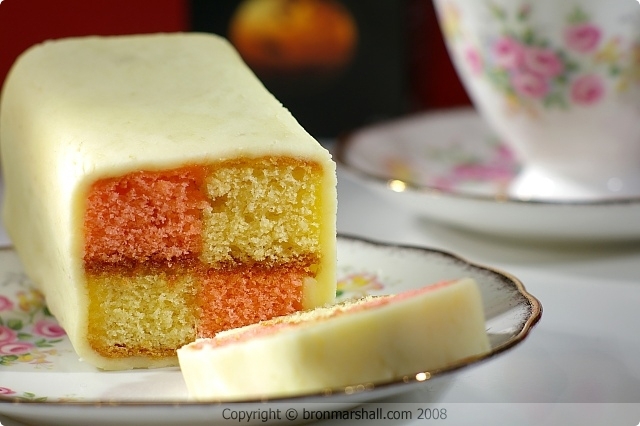 Battenberg cake is a popular commercially produced cake in England. It consists of four square lengths of a butter cake or sponge cake. 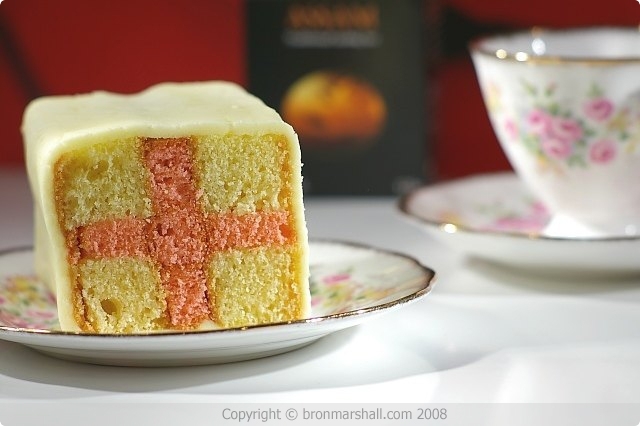 Two lengths are coloured pink and two left plain yellow, they are stuck together with apricot jam, so when you slice into it there is a checker board cross-section. The two tones are believed to mimic the marbled effect of many German breads and cakes. Finally a sheet of almond paste is wrapped around the outside. 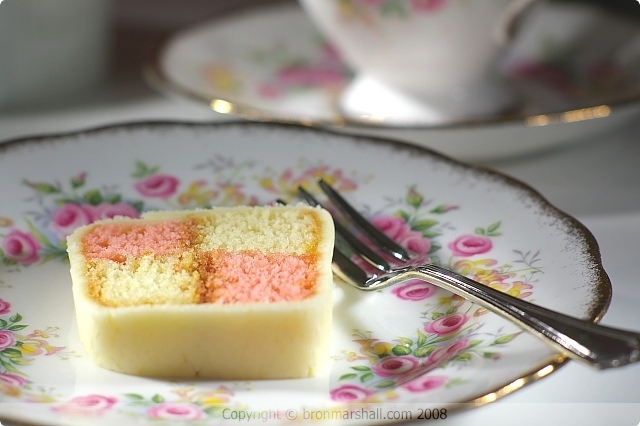 Battenberg cake is originally thought to have been created in the late 19th century, although the first recorded mention of the cake was in 1903. It has been suggested that it was perhaps named to commemorate the marriage between Princess Victoria of Hessee-Darmstadt, granddaughter of Queen Victoria to Prince Louis of Battenberg in 1884. Prince Louis later took British nationality and Anglicized his name to Mountbatten. Line sponge roll or shallow square cake tin with baking paper. Cream the butter, vanilla and sugar until light and fluffy. Sift the flour, baking powder and fold into the creamed mixture. Add sufficient milk to give a soft dropping consistency. Spoon half the mixture into one half of the prepared tin as neatly as possible. Add a few drops of red food colouring to the remaining mixture to turn it a pink colour, then spoon this into the other half of the tin, try to get the join between the two mixtures as neat as possible. Bake for 35-40 minutes or until the cake is well risen, springy to the touch and has shrunk slightly from the sides of the tin. Trim the edges of the cake and then cut into 4 equal strips down the length of the colours. one plain piece next to one coloured one, and then vice versa to make a checker board effect. Brush the top of the assembled cake with apricot jam. Roll out the almond paste into a rectangle the length of the cake and sufficiently wide to wrap around the cake. Invert the cake on to the almond paste, then brush the remaining 3 sides with apricot jam. Press the almond paste neatly around the cake, arranging the join in one corner. In honour of St. George’s Day celebration, I also played around with the two colours to create a cross-section of the English flag - the St. George cross!